As a UNC Student, I was saddened by the headlines that flooded the Internet yesterday, but I was also moved by what a huge impact the news had on both a national level as well as on a local and personal level. Former UNC Men’s Basketball Coach Dean Smith passed away late Saturday night, February 7th, 2015, at the age of 83. This news comes on the heels of the passing of fellow UNC alum and famed ESPN broadcaster Stuart Scott, who succumbed to his long battle with cancer in January. In both instances, I received the sad news via text messages from close friends from college. It seemed as just as the first Tweet confirmed the Tar Heels’ passing, group iMessages were formed the news was immediately shared. Soon after, it seemed like a proliferation of articles, pictures, and memories were shared on virtually every popular social media site, such as Facebook, Twitter, Instagram, SnapChat, and YikYak. Tweets and Retweets lamenting both Smith and Scott’s passing were the first to roll out, while blog posts about what each meant to the University community, to professional and collegiate sports, and to the world were soon posted. Articles soon began to circulate on Facebook, while many changed their profile pictures to honor Smith and Scott. 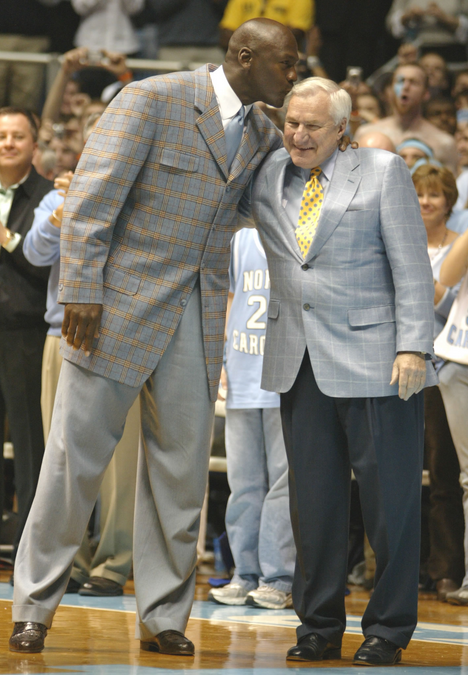 A picture of Smith and Michael Jordan in the Dean Dome circa 2007 went viral (shown below). 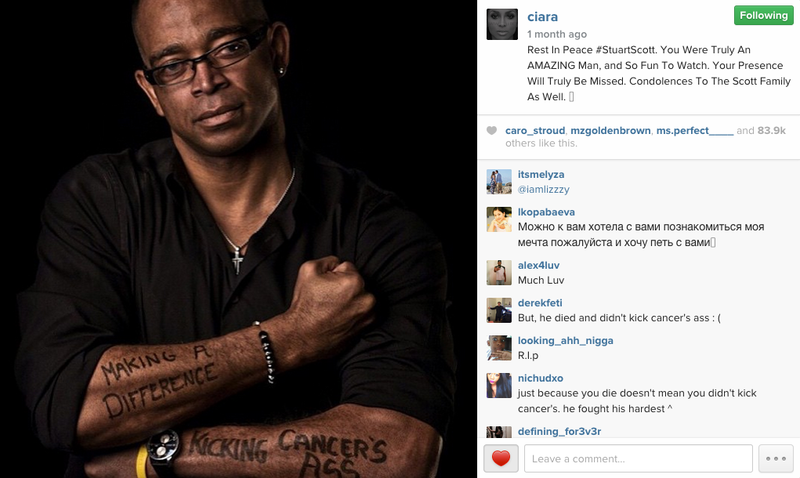 It seemed like no time before I began to see Instagrams celebrating the lives of both men. Similar shots to those posted on Facebook were uploaded to Instagram, accompanied by lengthy captions detailing what the men meant to each poster. Breaking news first spreads on Twitter and is Retweeted endlessly before people begin to share their own reactions on the site. Articles and blogs are quickly written and updated as new information emerges. These pages are linked to in new Tweets. Articles from Twitter and national and local news outlets are shared on Facebook. From Facebook the news is digested and re-shared, while some people may choose to change their Profile Picture or Cover Photo in honor and remembrance. Some people post photos they have personally taken or which have been circulating on the web on Instagram and accompany the post with a caption celebrating the life of the deceased. It is interesting to note that Twitter has become the place where breaking news is posted and shared, but it also makes complete sense. Personally, after hearing any sort of breaking news I head to Twitter. Yesterday I knew that a collective effort of reporters and Carolina fans would be flocking to the platform to share any and all information, new and old. While many national news organizations published lengthy articles yesterday, the New York Times and ESPN among my favorites, local sports writers, like Adam Lucas, also shared their memories about Dean Smith’s legacy and what it means and will continue to mean for years to come. While it comes at no surprise that many in the sports and journalism worlds had many great things to say about Smith, it was particularly special to see the number of fans paying tribute to Coach Smith in their own ways. Logging into Facebook yesterday, I was initially surprised that every story on my news feed revolved around Smith’s passing. Stories, memories, condolences, and grief were shared not only by my friends at UNC, but also from friends and family back home, some without a formal connection to UNC besides being basketball fan. But that’s exactly the legacy that Smith leaves behind: admiration, respect, and perhaps above all else, loyalty.